Systemic sclerosis, also known as scleroderma, is a multi-system, autoimmune disease, characterized by functional and structural abnormalities of small blood vessels, fibrosis of the skin and internal organs, and production of auto-antibodies. It is a rare, chronic autoimmune rheumatic disorder characterized by degenerative changes and scarring in the skin, joints, and internal organs and by blood vessel abnormalities. Swelling fingers, intermittent coolness and blue discoloration fingers, joints freezing in permanent (usually flexed) positions (contractures), and damage to the gastrointestinal system, lungs, heart, or kidneys may develop. Antibodies in the blood characteristic of an autoimmune disorder. There is no cure for systemic sclerosis, but symptoms and organ dysfunction can be treated. Systemic sclerosis causes an overproduction of collagen and other proteins in various tissues. The cause of systemic sclerosis is not known. The disorder is 4 times more common among women (particularly black) and most common among people aged 40 to 50. It is rare among children. Symptoms of systemic sclerosis may occur as part of mixed connective tissue disease, and some people with mixed connective tissue disease ultimately develop severe systemic sclerosis. 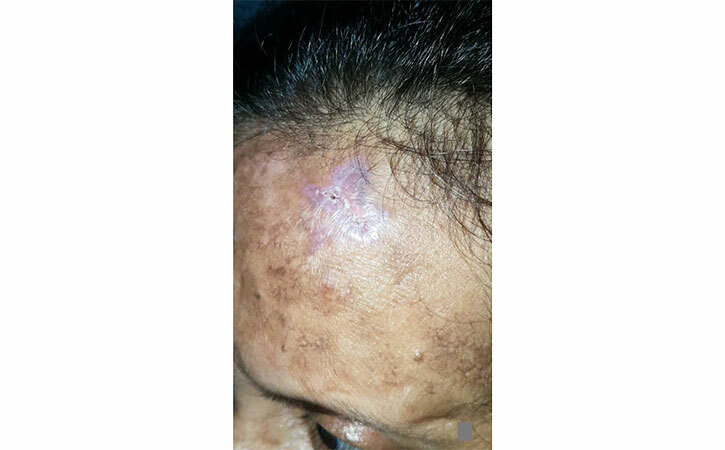 Systemic sclerosis without scleroderma (systemic sclerosis sine scleroderma). Limited systemic sclerosis affects just the skin or mainly only certain parts of the skin and is also called CRST syndrome. People who have this type develop skin tightening (scleroderma) over the face and beyond the elbows and knees and may also have gastroesophageal reflux disease. This type is progressed slowly and is often complicated by pulmonary hypertension, a condition in which blood pressure in the arteries of the lungs (the pulmonary arteries) is abnormally high. Generalized systemic sclerosis often causes skin damage that is widespread throughout the body (also called diffuse systemic sclerosis). People who have this type have Raynaud phenomenon and gastrointestinal problems. This type may progress rapidly. Major complications include interstitial lung diseases, which affect the tissue and space around the air sacs of the lungs (alveoli), and a severe kidney problem called scleroderma renal crisis. Systemic sclerosis without scleroderma rare occurs without the skin tightening of scleroderma. However, people have antibodies in the blood characteristic of systemic sclerosis and have the same internal problems. The initial symptom of systemic sclerosis is swelling, then thickening and tightening of the skin at the ends of the fingers. Raynaud phenomenon, in which the fingers suddenly and temporarily become very pale and tingle or become numb, painful, or both in responses to cold or emotional upset, is also common. Fingers may become bluish or white. Heartburn, difficulty in swallowing, and shortness of breath are occasionally the first symptoms of systemic sclerosis. Aches and pains in several joints often accompany early symptoms. Sometimes inflammation of the muscles (myositis), with its accompanying muscle pain and weakness, develops. Skin changes: Systemic sclerosis can damage large areas of skin or only the fingers (sclerodactyly). The skin becomes more widely taut, shiny, and darker than usual. The skin on the face tightens, sometimes resulting in an inability to change facial expressions. In some people, the skin can soften. Joint changes: Sometimes, a grating sound can be felt or heard as inflamed tissues move over each other, particularly at and below the knees and at the elbows and wrists. The fingers, wrists, and elbows may become stuck (forming a contracture) in flexed positions because of scarring in the skin. Gastrointestinal system changes: Nerve damage and then scarring commonly damage the lower end of the esophagus. The damaged esophagus can no longer propel food to the stomach efficiently. Abnormal cell growth in the esophagus (Barrett’s esophagus) occurs in about one-third of people, increasing their risk of esophageal blockage (stricture) due to a fibrous band or their risk of esophageal cancer. Damage to the intestines can interfere with food absorption (malabsorption) and cause weight loss. Lung and heart change: Systemic sclerosis can cause scar tissue to accumulate in the lungs and interstitial lung disease, resulting in abnormal shortness of breath during exercise. The blood vessels that supply the lungs can be affected (their walls thicken), so they cannot carry as much blood. Therefore blood pressure within the arteries that supply the lungs can increase (a condition called pulmonary hypertension). Systemic sclerosis can also cause several life-threatening heart abnormalities, including heart failure and abnormal rhythms. Kidney changes: The first symptom of kidney damage may be an abrupt, progressive rise in blood pressure (scleroderma renal crisis). High blood pressure is an ominous sign, but early treatment usually controls it and may prevent or reverse kidney damage. CREST syndrome: CREST syndrome, also called limited systemic sclerosis, involves more peripheral areas of the skin (not the trunk). It typically does not affect the kidneys and lungs directly but may eventually increase pressure in the arteries that supply the lungs (called pulmonary hypertension). Pulmonary hypertension can cause heart and lung failure. CREST syndrome is named for its symptoms: Calcium deposits in the skin and throughout the body, Raynaud phenomenon, Esophageal dysfunction, Sclerodactyly (skin tightening on the fingers), and Telangiectasia (dilated blood vessels or spider veins). In CREST syndrome, Raynaud phenomenon can be severe enough to cause sores on the skin (ulcers) and permanently damage the fingers and toes. Most patients do not have any relatives with scleroderma and their children do not get scleroderma. There is a susceptibility gene, which raises the likelihood of getting scleroderma, but by itself does not cause the disease. Currently, there is no cure for scleroderma, but there are many treatments available to help particular symptoms. For instance, heartburn can be controlled by medications called proton pump inhibitors (PPIs) or medicine to improve the motion of the bowel. Some treatments are directed at decreasing the activity of the immune system. Some people with the mild disease may not need medication at all and occasionally people can go off treatment when their scleroderma is no longer active. Because there is so much variation from one person to another, there is great variation in the treatments prescribed. To confirm the analyze, need to consult with a doctor. Patient needs long treatment. So patient needs regular consultation.